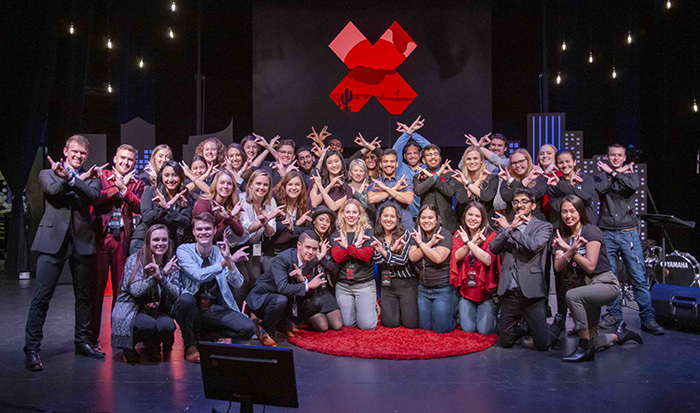 The sellout crowd in Ethington Theatre on Friday night probably wouldn’t be surprised to hear that intense planning went into the 2019 edition of TEDxGrandCanyonUniversity. But those observers no doubt would be stunned to know exactly what that preparation entailed. Heck, even Abe Lincoln could have learned a thing or two from the efforts of the 87 GCU students (33 team members, 54 one-day volunteers) who executed the third annual event from beginning to end, front to back, and every which way in between. Even though the professional-looking presentation of last year’s TEDxGCU drew raves, the team members saw a number of ways it could be improved as they chopped it up in post-production meetings. To start with, they started earlier. The staff was in place by last summer, and they communicated via Skype during the break to get a jump on what they would do once they returned to campus. But most notable were the improvements they instituted in the communication process with the speakers. Each speaker had a student liaison, and Toews (sounds like Taves) trained them to be picky. Every sentence, every word mattered. No detail was too small to overlook. But that’s just part of the story about this part of the story. Amy Kao said it felt “very natural” for the students to give her input on her talk. 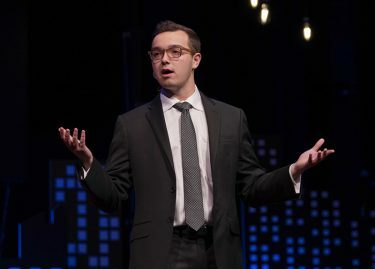 “To have a TEDx team member who’s a college student, not even graduated yet, critique them on a talk and tell them what to change is an extremely hard thing to pull off,” he said. The extra effort began long before the speakers were in place. The decision on whom to invite was conducted in a four-hour meeting of the directors and the 13-member Speaker Acquisition Team. They wound up with speakers addressing everything from fake drugs to questionable scientific research, from choosing purpose over fear in our decision-making to choosing real connections over smartphones in our relationships – a good cross-section of 14-minute talks that, in the TED tradition, shared technology, entertainment and design ideas. Afterward, those speakers addressed what it was like to work with the students. 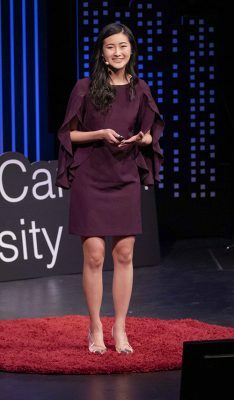 Amy Kao, who has made it her mission to increase awareness about fake drugs, was impressed by how the students made it their mission to help her. Like Friedman, it was her first TEDx talk. Brian Mohr normally uses a PowerPoint for his presentations but agreed to go without it on the advice of his student liaison, Madeline Hooten. “I’m glad I did,” he said. Just as natural as the talks themselves. 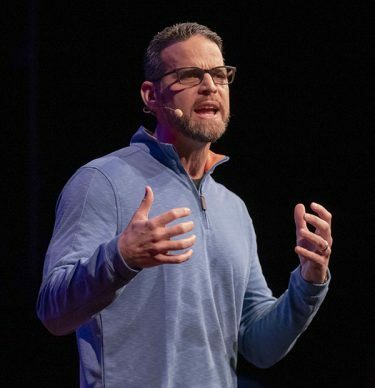 Not many people can give a 14-minute talk from memory without stumbling or hesitating, and Brian Mohr – another first-timer on the TEDx circuit – explained how time-consuming it is to prepare for that task. Mohr estimated that he put in three 40-hour weeks of preparation even though he’s an experienced public speaker. He practiced his talk, on creating more meaningful connections in our lives, another eight times Friday in his family room. That was typical of the kind of impact the students had – and the kind of energy they expended. Toews said it was more like seven hours a week – the students do have to go to classes, after all – but it was a labor of love for both her and junior Konnor Bennett, another director who drew considerable praise for his work. The film production major was the Director of Videography, and his little touches were evident all evening – right down to the closing video, which featured scenes shot just moments earlier. He said that idea was hatched in the last few weeks. Dominic Pachuilo was resplendent in his red suit. 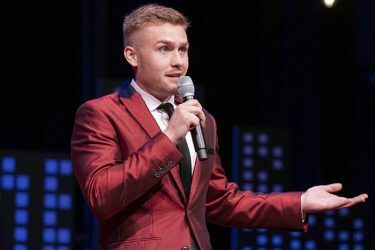 The audience certainly couldn’t miss the swanky red suit worn by TEDxGCU President Dominic Pachuilo, whose leadership has been the catalyst behind all the positive vibes the last two years. Even that suit was well-planned. Pachuilo wanted to do something special in his final TEDx event, so he waited for the after-Christmas sales and then found his red gem at Macys. “I’ve got to go all out. I’ve got to go all red,” he told McLean, who will be his successor. Having Caleb Duarte as the emcee was another good addition this year. About the only thing that wasn’t planned was emcee Caleb Duarte’s opening monologue. But that still turned out well, too. And, like the speakers, Duarte was awed by the dedication of the TEDx team. He wants to be a major talk-show host someday, and his first exposure to TEDx is another step in that journey. “It makes me realize that to get to the top I just want to keep working with people who are passionate,” he said. There will be more trees to chop down next year. It won’t be long before the TEDxGCU student team is sharpening the axe once more. So proud of my friends at GCU! Can’t wait for next year. Go Lopes!